Another year of Kansas State football is upon us and there’s some weird mixed feelings going on. Maybe not in Manhattan, but certainly down here in Austin and in this Purple Yeti’s abode. You see, part of me wants to believe that Kansas State will improve upon its amazing record from last year, but another wants to believe in the negative hype the so called sports media jams down my throat. Is everyone writing off Kansas State too easily, or will reality hit hard for the little Wildcats from the Little Apple? Last year’s Cotton Bowl, where Kansas State lost readily to Bobby Petrino’s Harley Hogs of Arkansas, I could tell that the team was physically outmatched. They’ve been outmatched so many times last year and yet they usually came out on top. Heck, they were a 4th down play away from doing what Iowa State eventually did against Oklahoma State, upset them. So when the final second ticked off in the Jerry Dome, I was dejected but also proud of how the Wildcats the fought to get there. The dejection and pride now turns to worry. Kansas State won most of their games by 7 points or less last year. It was a statistical anomaly. Everytime some sports media goofball previews the team, they point to that first. Kansas State has to fall back down to Earth, right? Just look at the rest of the league. The Big 12 loses mid card mush mouths in Texas A&M and Missouri in exchange for West Virginia and TCU, last year’s champions in their respective conference. Surely, the competition will be much too tough than what that plodding team in the Jerry Dome could keep up with. But I have a real hard time believing them. Kansas State brings back 17 starters, including anchors on the both sides of the ball, Collin Klein on offense and Arthur Brown on defense. Arthur Brown arrived in a big way last year and will leave after this year with a career in the NFL. Collin Klein might not have a career in the NFL, but he is a dark horse for Heisman this year. Lest us not forget about Bill Snyder either. He will have those kids prepared. But there is one player that makes the difference for me. Tyler Lockett. The sophomore had a shortened season last year due to a lacerated kidney. If it wasn’t for that strange medical procedure, he would’ve nabbed freshman of the year awards. He was the speed that they Wildcats needed and missed in the Cotton Bowl. He comes from great pedigree, too, with both Kevin and Aaron playing for Kansas State and eventually in the NFL. He’s the piece that puts my confidence in this team to at least maintain some semblance of success. Teams won’t be ready for him. 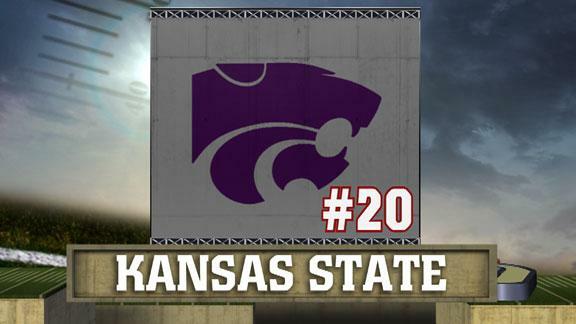 So how do I see Kansas State this year? Well let’s hit up the schedule chronologically. The first three games, Missouri State, Miami, and North Texas should be wins. Miami will be the close one but I’m pretty sure the Hurricanes have never played in Manhattan before. Next up is Oklahoma and I hate to say that even though the Sooners are depleted on offensive line all of the sudden, Bob Stoops has Billy Snyder’s number and he will dial it in again. After a somewhat closer win against Kansas, they head to Ames to play Iowa State in Farmageddon for the first time since 2007, where they lost. In fact the last two times, they played there they lost. I’m immensely worry about this game. Paul Rhoads always has an upset in his deck and this could be the one he’s looking for this year. Farmageddon has been amazingly close the last three years and I’m leaning on the Cyclones to turn the corner. There’s no other explanation I can give but the law of statistics (ironically enough). I think they lose another Farmageddon classic. That lose will send a pretty hard blow to the Wildcats as they head to Morgantown for the first time to take on West Virginia. The Mountaineers are too fast on offense. 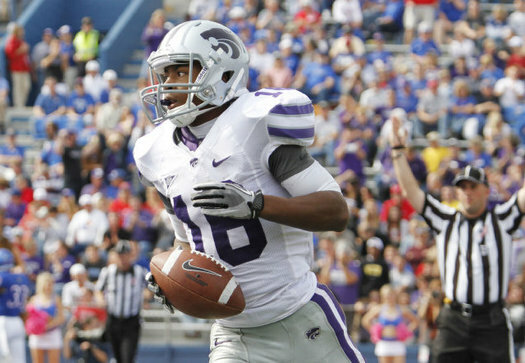 Kansas State’s only chance is to do some serious Snyderball and keep Geno Smith off the field. Only, they’ll still be dazed from the previous week’s upset that they let this one slip against a great team. What’s funny is I think they right the ship and win out. Texas Tech always finds a way to lose and Tommy Tubberville may have a fiery seat come the time they play Kansas State. Oklahoma State won a close on last year and I think the Wildcats will be up for this one way more than the Cowboys. TCU is tough but they came from a mid major conference. So Kansas State will do what they always do to mid-cons and play them real close. They’ll sneak out with a win. Baylor lost way too much talent to keep that offense going so I see a steady win there. Finally, I see Texas losing another one to Kansas State to close out the year. We go into this year with Longhorns juggling a dual quarterback situation and I think Mack Brown’s mediocre coaching will get exposed. Texas talent be damned. So I see Kansas State closing out the season with a respectable 9-3 record. That might land them a 2nd place finish in the crowded Big 12. I’m not sure just yet, it could be 3rd. At any rate, they will make a pretty good bowl, not Beef O’Brady’s or Car Fart Emporium Bowl. End of the year awards will not see much on Collin Klein’s hands, but I see Arthur Brown notching some top honors easy. Look out for Tyler Lockett too. It’s strange to think a team that finished with 10 wins and returns 17 gets knocked around so much, but they are used it. They thrive on it.